Using the Hubble Space Telescope, a team of astronomers has taken an image of a planet around the star Fomalhaut. It is the first such image of an exoplanet taken in visible wavelengths. The results have been published today in the journal Science. Fomalhaut lies 25 light years away in the constellation Piscis Austrinus, the Southern Fish, and is surrounded by a striking debris ring. The planet, Fomalhaut b, resides inside this ring and orbits the star at a distance of 119 astronomical units (an astronomical unit, AU, being the distance between the Earth and the Sun). In other words, Fomalhaut b orbits its star at nearly four times the distance that Neptune does from the Sun. Previous Hubble images of the debris ring have shown it to bear an uncanny resemblance to the ‘eye of Sauron’ from the Lord of the Rings films. This 2006 Hubble Space Telescope optical image shows the belt of dust and debris (bright oval) surrounding the star Fomalhaut and the planet (inset) that orbits the star every 872 years and sculpts the inner edge of the belt. A coronagraph on the Advanced Camera for Surveys blocks out the light of the star (centre), which is 100 million times brighter than the planet. Image: Paul Kalas, UC Berkeley/NASA/ESA. Professor Paul Kalas of the University of California, Berkeley, has been studying the Fomalhaut system for 15 years. He first imaged Fomalhaut’s debris belt in 2005 using Hubble’s Advanced Camera for Surveys, and quickly noticed that the belt had a sharp, inner edge. "The gravity of Fomalhaut b is the key reason that the vast dust belt surrounding Fomalhaut is cleanly sculpted into a ring,” he says. This is similar to the way that Saturn’s rings are kept trim by the activity of its moons. 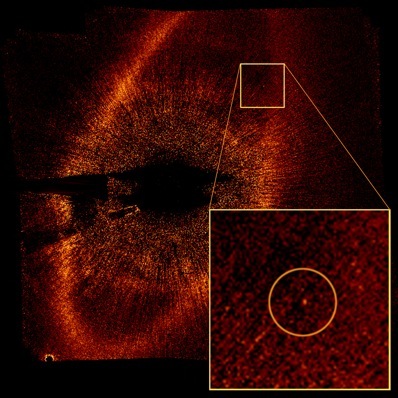 It has taken three years to obtain two images of Fomalhaut b. But with these images, Kalas has been able to show that the planet has an annual orbit of 872 years, correlating exactly with its distance from the star. And it gets even more interesting. Kalas and his team detected a dip in the planet’s brightness by half a stellar magnitude in the time that the two images were taken. What could be the explanation? Hot gas from the debris ring around the planet, and a hot outer atmosphere heated by convective cells, have both been touted as explanations. But could the dip also be due to a moon passing in front of the planet? “That would be one exotic possibility that requires future observations to either confirm the idea, or exclude it,” Kalas says. Unlike some other exoplanets that have tended to be very large (several tens of Jupiter masses), Fomalhaut b is between 0.3 and 2.0 Jupiter masses (and most likely about the same mass as Jupiter). This means that, in the words of study coauthor Professor James Graham, “It will be hard to argue that a Jupiter-mass object orbiting a star like Fomalhaut is anything other than a planet.” And in fact Kalas says, “One hypothesis that we put forward is that Fomalhaut b is surrounded by a circumplanetary dust ring that reflects light toward Earth. In this case Fomalhaut b could have a mass as low as that of Neptune.” If that is indeed the case it would make Fomalhaut b five-percent the mass of Jupiter.